If your sciatic nerve attacks do not let you move and paralyze you completely, we will teach you how to perform exercises that will serve to unlock and thus relieve the pain. A lumbar disc hernia usually causes pain in the sciatic nerve. Other common disorders that cause sciatic pain include degenerative lumbar disc disease, spondylolisthesis, spinal stenosis, or osteophytes and arthritis in the spine. 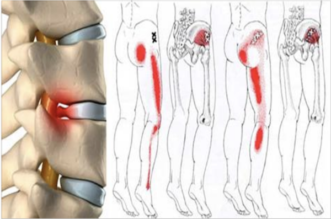 TWO SUPER SIMPLE WAYS TO REMOVE SCIATICA PAIN ! It is important to know that movements must be made within the possibilities that each person has to perform the movements, in addition to contemplating the pain that is felt and without exaggerating the movement. It is appropriate to begin with gentle movements and then increase the frequency, intensity and time as the pain subsides. The floor is the best place to perform these exercises. You can use a rug or a mat. 1.Stand flat on the floor with arms and legs stretched out. -Relax the muscles and accustom the body to the floor. -Raise your sore leg by flexing gently and bring it to your shoulder with the help of your hands. Hold the position for a few seconds until you feel the tension and leave it bent for 30 seconds. – Switch to the other leg and repeat this exercise alternately a few times. 2.Put yourself back on the floor and flex both legs to the chest as you cross over one another. -With the help of your hands hold the position until you feel the tension in the muscles. – Stay in this way for 30 seconds, stretch your legs and repeat again until the tension loosens. Perform these exercises as many times as you think necessary until you regain normal mobility.